Trying out the upgrade to Delta® Economy Comfort™, it is definitely nice to board early to make sure our hand carry bags will fit up top, and the extra leg room never hurts! Also, thank goodness we were closer to the front, or our flight connection would have been nearly impossible and probably required some racing from gate to gate! 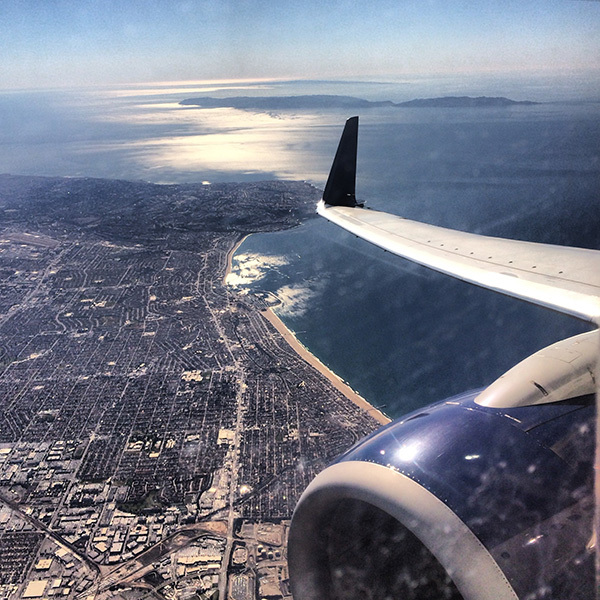 The weather in LA was stunning when we left! 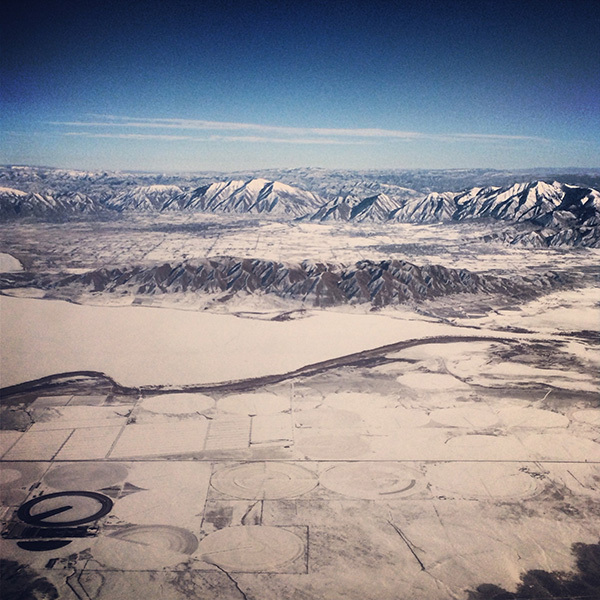 A peek at Mt. 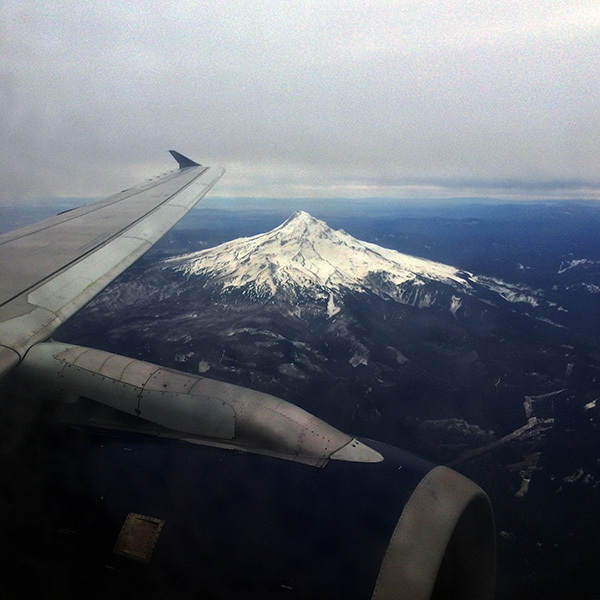 Hood as we arrived in Portland! 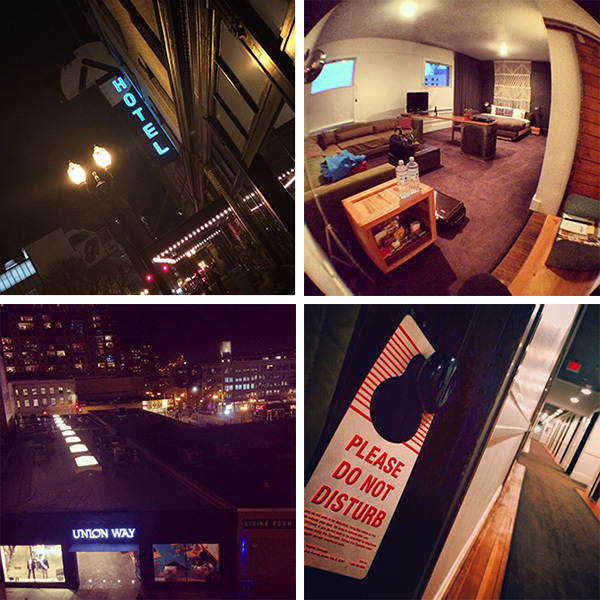 Our hideaway in Portland got upgraded to a large superior deluxe corner room at the Ace Hotel Portland! Our view looked out to the new walk through shopping of Union Way which leads you right to the monstrous and historic Powell’s Bookstore. Union Way is a fascinating shopping concept that merged two buildings and created a walkway through them with inward facing shops. With familiar stores like Steven Alan, Marine Layer, Danner Goods, Self Edge, as well as Spruce Apothecary from the folks at Canoe - and my favorite, Quin candy store! 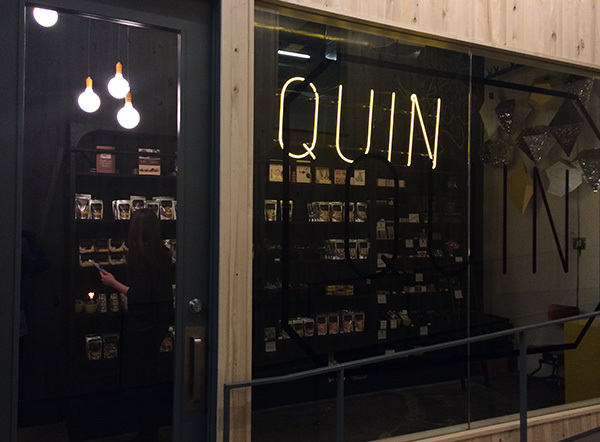 Quin Candy has a delightful mix of unusually flavored and beautifully packaged lollipops, caramels, gumdrops, and more handcrafted just a few blocks away! We could resist indulging in some blackberry tangerine gumdrops and peanut butter roasted banana caramels! and fully agree that #CandyIsMagic! 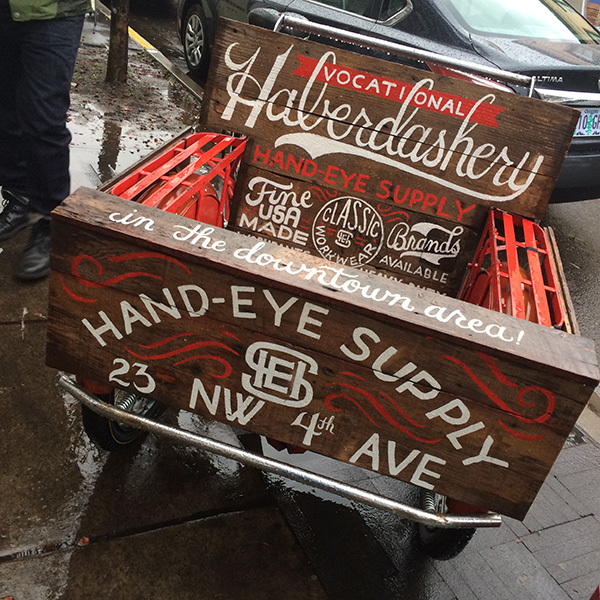 Another Portland MUST that I was thrilled to finally see in person is Core77’s amazing Hand Eye Supply store filled with “tools, books, & clothing for practical purposes” aka too many well curated tools a designer/maker can’t resist! 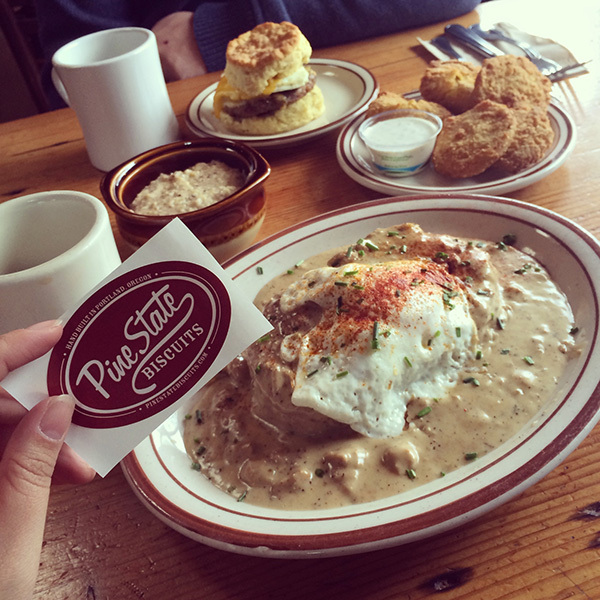 Even though we were well prepared for how incredibly abundant the food (and coffee and beer) scenes are and came to terms with the fact that we would not possibly be able to try even a fraction of the delicious recommendations, we did go for a proper breakfast/brunch at Pine State Biscuits that did not disappoint! And Shawn’s southern roots showed through when he tried the grits and the grin on his face just spread… and then the fried green tomatoes… and the biscuits and gravy… deliciousness! Beautiful typography both old and new were everywhere! 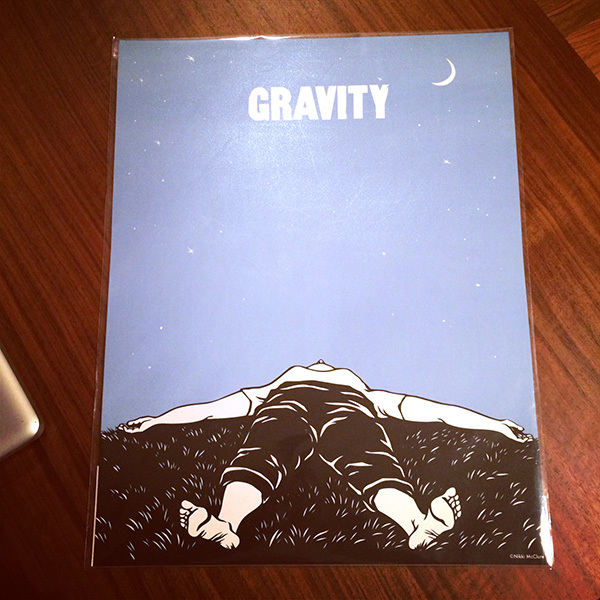 From signage to branding, i was font giddy all over the city. Also found some adorable and pristine vintage cars on our adventures. 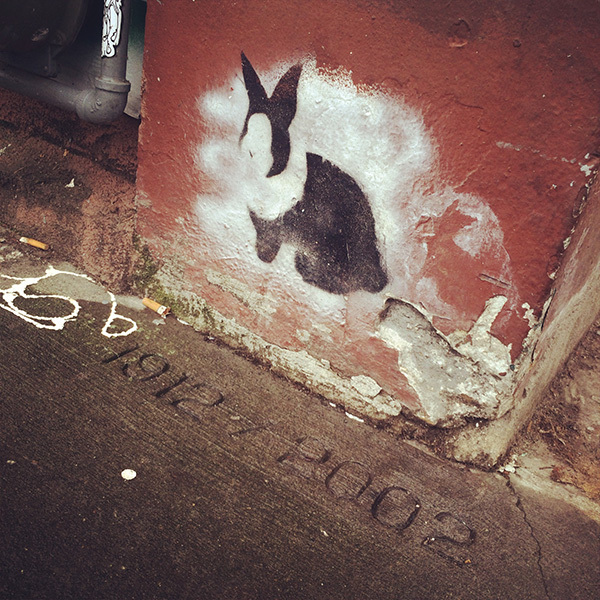 Wandering the streets, I found this little street art bunny! You apparently, can not go to Portland and not to doughnuts. Well, while some say you HAVE to do Voodoo Doughnuts, we had quite a few people recommend Blue Star Donuts instead - and they are AMAZING. The meyer lemon with key lime curd… and the blackberry bourbon basil… WOW! 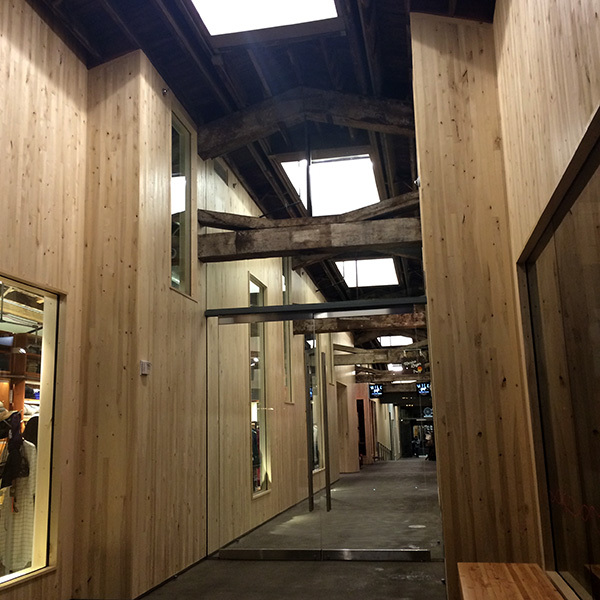 On Portland brands I was excited to see in person - Poler and Tanner Goods were high on the list. 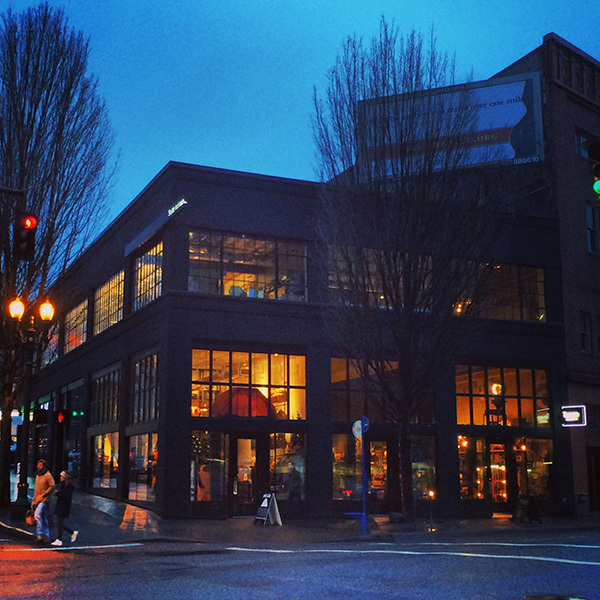 For more Portland tips, the folks at Tanner have put together quite the Field Guide to Portland. And on exciting news, their downtown LA store is opening this month! 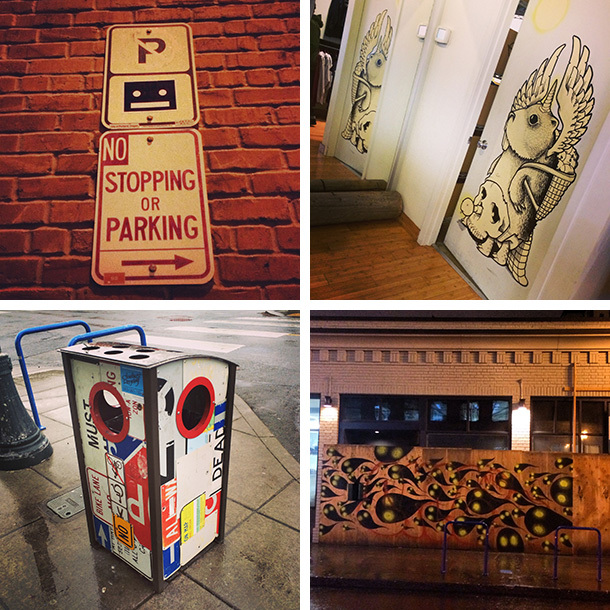 More fun street art spotted, as well as these recycled street sign trash/recycling bins on the street! 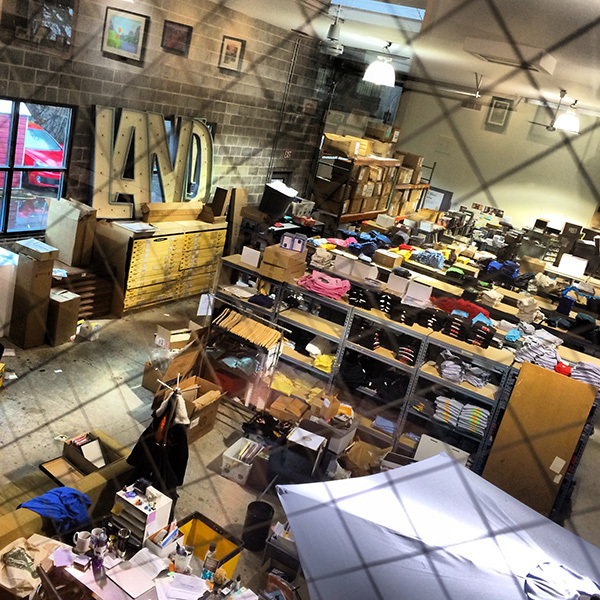 A peek behind the scenes of Land Gallery. Cal Skate Skateboards is the largest and oldest skateboard shop in Oregon, having been open since 1976. In addition to quite the selection of boards and gear, they even have spinning tops made from recycled boards. 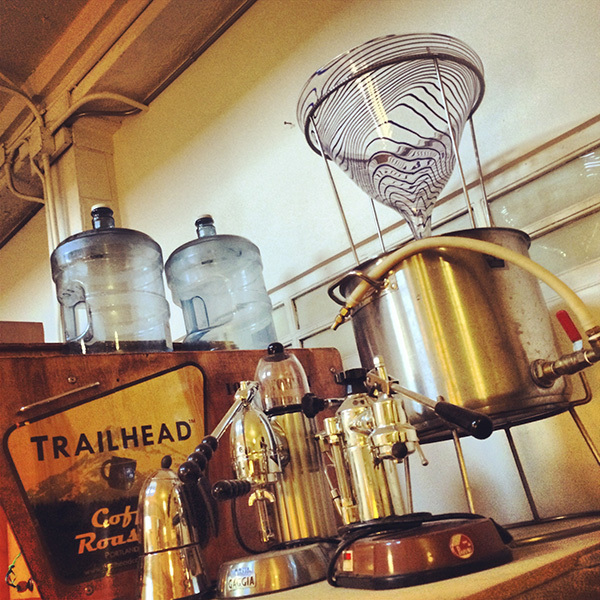 The Trailhead Coffee Roasters - bike powered in Portland! We popped in to their cafe and fell for their mesmerizing hand-blown glass funnel in their rig that can be hooked up to a bike to brew coffee! 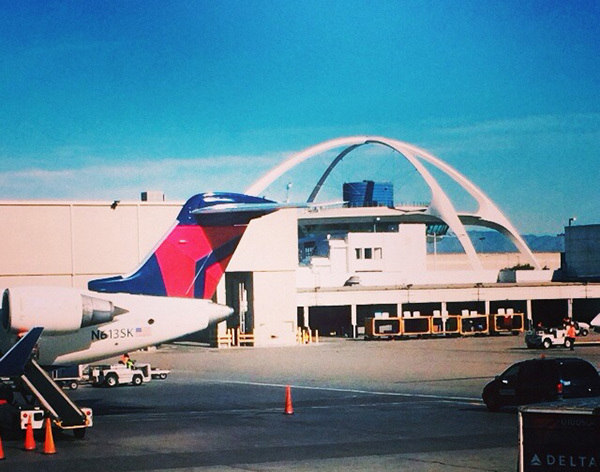 … and before we knew it, two days flew by, and it was time to head back to LA. 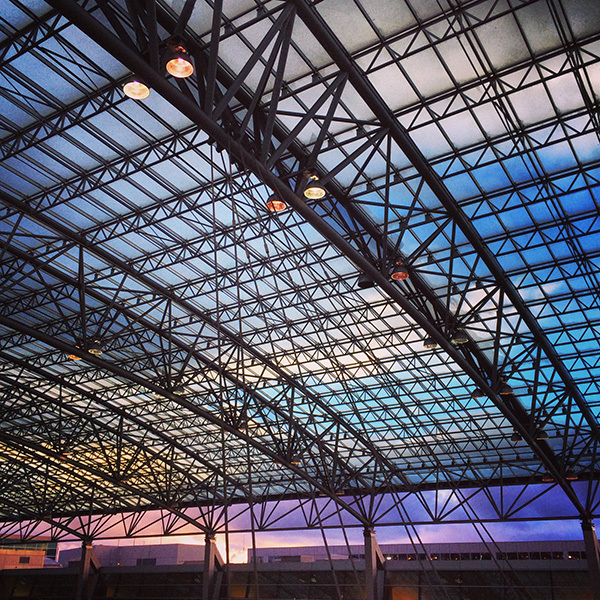 The dramatic colors of the stormy afternoon at the airport looked beautiful. We also learned that taking pictures of #PDXcarpet is a thing, and it’s especially controversial that they are switching from the carpet Shawn is standing on, to the one you see my feet on. They even have t-shirts (and these) and socks with the PDX Carpet pattern! 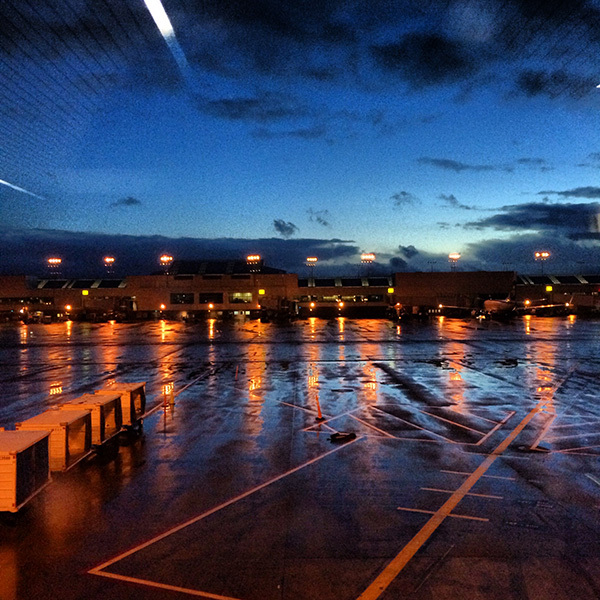 Sunset was particularly dramatic on the wet tarmac! 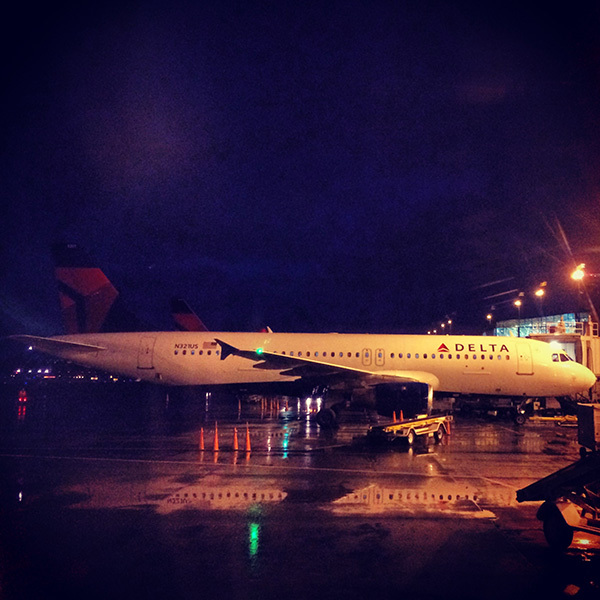 … and the reflections as we waited to head back to LA were gorgeous! 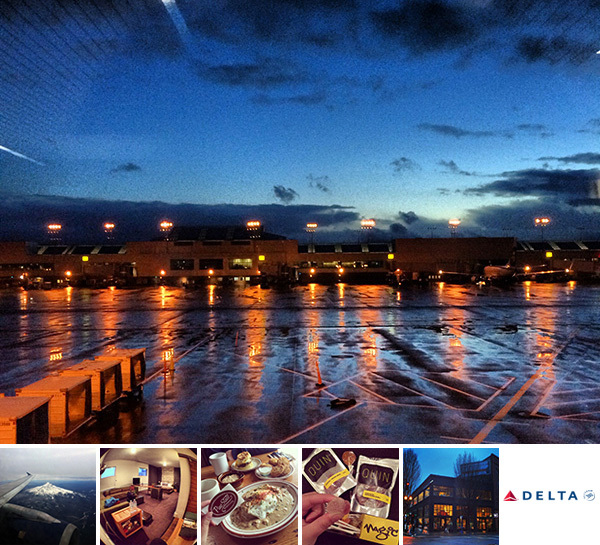 So there you have it, some of our favorite discoveries and inspirations from Portland ~ Thanks, Delta®, for encouraging us to enjoy life and embrace the little upgrades along the way!